Home | New Releases | Rosemary Millette Oversized Open Edition Wrapped Canvas::"Tranquil Waters – Whitetail Deer"
Image size: 33-1/2"H x 45-1/2"W x 1-1/4"D.
About the Art: “It was my intent to have shades of foggy greens and grays create a tranquil mood in this painting of whitetail deer.” -R.M. Offering the character and texture of an original painting, our wrapped canvas art prints are beautifully printed with fade-resistant inks on durable high-quality canvas. The image wraps fully around the edges of each canvas. No frame needed! Arrives ready to hang. Made in the USA. 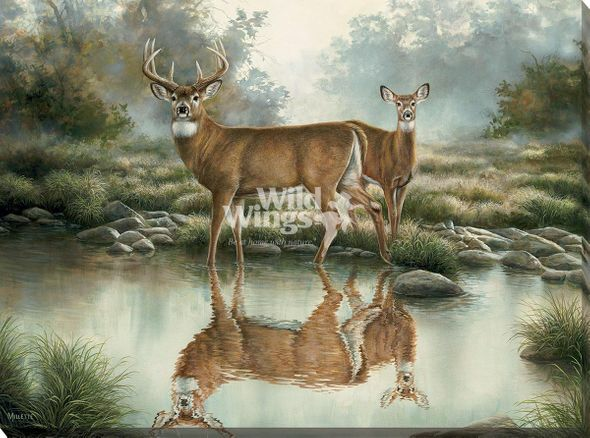 Home | Fine Art Prints & Limited Editions | Wild Wings | Wild Wings New Releases | Rosemary Millette Oversized Open Edition Wrapped Canvas::"Tranquil Waters – Whitetail Deer"
Home | Framed Art | Wildlife Art | Rosemary Millette | Rosemary Millette Oversized Open Edition Wrapped Canvas::"Tranquil Waters – Whitetail Deer"
Home | Fine Art Prints & Limited Editions | Wild Wings | Rosemary Millette | Rosemary Millette Oversized Open Edition Wrapped Canvas::"Tranquil Waters – Whitetail Deer"